We’re offering a unique opportunity to grow with a start-up ed-tech company in Maryland (Baltimore-Towson-Columbia area). Opportunities abound providing individual and group therapy to K-12 students with language disorders, and language-based learning disabilities, as well as articulation deficits. We offer flexible scheduling and good pay. 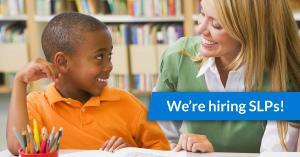 We’re looking for kind, creative, enthusiastic SLPs with MD License and ASHA CCC’s. We’d love to hear from you! Send us an email us at info@infercabulary.com.